Far too many LED bulbs choke when it comes it comes to being paired with a dimmer switch. The problem can be particularly acute when you pair an LED with a smart dimmer. The bulbs I’ve tested—including those advertised as being dimmer compatible—typically sputter, buzz, hum, or fail to work altogether when I install them in a fixture controlled by one of my in-wall Z-Wave dimmers. I was beginning to wonder if I’d need to replace my smart lighting controls with dumb switches as I change over from incandescent to LED lighting when Cree told me they were about to ship a whole line of new LED bulbs that work perfectly with dimmers. Cree is shipping a complete line of LED bulbs, including A19, three-way, BR and PAR bulbs, and a candelabra style. In a product briefing a couple of weeks back, Safarikas boasted of Cree’s 10-year, satisfaction-guaranteed warranty for its entire new line. “Light bulbs are no longer throw-away items,” he said. “They can go in your home and improve your home for decades to come. So we’re taking a page out of the more-expensive bulb-makers’ playbook [with this 10-year warranty]. 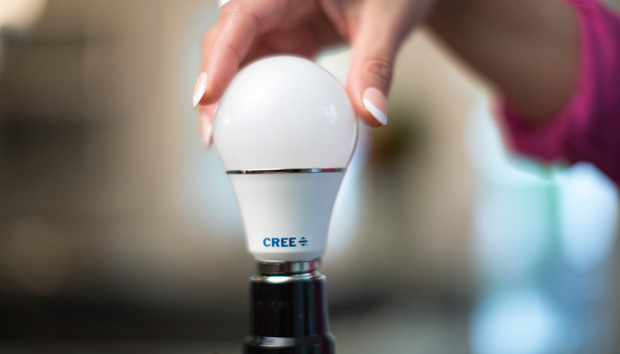 Cree also offers a line of smart bulbs that are equipped with ZigBee radios (we reviewed its Connected Soft White bulb in early 2015). As such, those bulbs are designed to be controlled via a central controller (e.g., a Wink or SmartThings hub, or a more sophisticated control panel from a manufacturer such as Vivint). You can control them with a smartphone, tablet, or a personal computer, but those devices send commands to the hub and the hub sends them to the light bulb. This new line of bulbs must be controlled by the fixture they’re installed in or the switch on the wall that they’re wired to. This significantly reduces the cost of the bulbs, but that savings is absorbed by the cost of the smart switch. Three LED bulbs compared to a traditional incandescent. From left to right: A Sylvania incandescent, a C by GE Life smart bulb, a Philips non-dimmable LED, and a Cree dimmable LED. Smart bulb, or smart switch? I’ve tested a number of smart bulbs, but I’ve lived with smart switches for nearly 10 years. Smart switches are the way to go. Here’s why: First and foremost, no matter how intelligent a smart bulb might be, it becomes dumb the instant you install it in a fixture that’s controlled by a switch on the wall. If that switch is in the off position, the bulb isn’t receiving any power and therefore can’t be controlled by anything. Secondly, many smart bulbs—especially Bluetooth bulbs—offer local control only. You can’t control them over the Internet (though this is less true of Wi-Fi bulbs and ZigBee bulbs that are controlled by hubs.) And finally, if the light in question is a chandelier with multiple bulbs, you’ll want all the bulbs to turn on or off or dim at the same time. That’s difficult, if not impossible, to do with smart bulbs and an app. Okay, let’s get down to brass tacks and discuss the A19 soft-white LED bulb that Cree sent for this review. Of the three white-LED bulbs I looked at, Cree’s product bore the closest resemblance to an ordinary A19 60-watt equivalent, incandescent bulb. The C by GE Life came in second, followed by the slightly smaller, non-dimmable Philips A19 60-watt equivalent. The shape of the bulb can impact which light fixtures you can put it in (some lamps have shades that clip to the bulb), and it can also impact the bulb’s ability to project light in all directions. This chart compares the features in three of the leading LED A19 replacement light bulbs alongside a traditional incandescent bulb. Cree classifies its bulb as soft white, with a color temperature of 2700K. Of the three bulbs I compared to the Sylvania, the Philips bulb came closest to matching the Sylvania’s color, but the Cree was brighter than the other two, producing 815 lumens compared to 800 lumens for both the GE and the Philips bulbs. That brightness came at the cost of just two more watts than the Philips bulb, however, and the Cree consumed two watts less than the GE. According to the Kill A Watt model P4400 wattmeter I used, the Sylvania incandescent burned 58 watts, the Cree used 9 watts, the GE bulb consumed 11, and the Philips used the least amount of power—just 7 watts. All three bulbs did a very good job of casting their light evenly and in all directions, and the Cree bulb dimmed smoothly and evenly without making any noise. Being a smart bulb, the C by GE Life can be dimmed via Bluetooth using its app, but it’s completely incompatible with in-wall dimmers. The Philips bulb is dumb, like the Cree, but it can’t be dimmed at all. Light bounced off of a metal surface with a satin white finish. From left to right: A Sylvania incandescent, a C by GE Life smart LED, a Philips non-dimmable LED, and a Cree dimmable LED. If you don’t care about dimming your lights, Philips has the better deal—at least in the short run. You can buy four of those bulbs for about $14, where four of Cree’s bulbs cost $20. But don’t forget that Cree’s bulbs are rated to last more than twice as long as Philips’, and they have a 10-year warranty to back that up. Philips warrants its bulbs for only three years.